Prime Minister Justin Trudeau and Unifor National President Jerry Dias make their way to a meeting on Parliament Hill in Ottawa, Ont., on Tuesday, Nov. 27, 2018. Prime Minister Justin Trudeau and U.S. President Donald Trump spoke by telephone on Tuesday and vowed to work together to help auto workers displaced by General Motors plant closings. Both leaders expressed their deep disappointment with the auto giant’s decision to close five factories and cut up to 14,800 jobs in the United States and Canada, the Prime Minister’s Office said. The President later angrily unleashed on GM on Twitter for the job losses. Many of those cuts are coming from the Midwest, where he has promised a manufacturing rebirth. The White House has threatened to cut all GM subsidies, including for its electric-cars program. GM has not recently taken advantage of Canadian subsidies. On Wednesday, Mr. Trump said auto tariffs are “being studied now." Such tariffs would have prevented GM from shuttering its U.S. plants, Mr. Trump added. Mr. Trump also retweeted a suggestion that GM should pay back the money the government spent to keep it afloat as part of the auto industry bailout if it doesn’t keep jobs in the country. Ottawa has taken a more measured tone, with Mr. Trudeau and Ontario Premier Doug Ford saying they were disappointed but focused on supporting workers who were losing their jobs. Meanwhile, the union representing auto workers in Oshawa, Ont., where nearly 3,000 jobs are at stake, is calling for mass walkouts at General Motors plants on both sides of the border and joint Canada-U.S. action to impose hefty tariffs on GM vehicles made in Mexico. 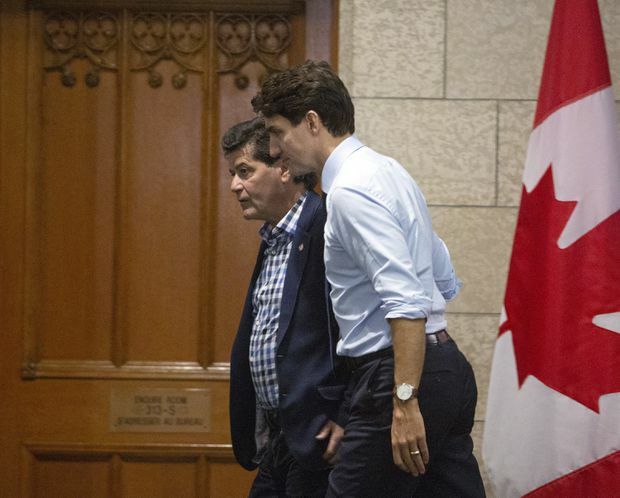 Unifor president Jerry Dias’s proposal to hit GM with tariffs as high as 40 per cent was not picked up by Mr. Trudeau in the discussion with Mr. Trump. Mr. Dias met with the Prime Minister on Parliament Hill and pressed him to work with Mr. Trump to force General Motors to reverse its plan to end production at the five plants, including the one in Oshawa. “We have said to the Prime Minister he should raise with the President of the United States that if, in fact, GM does not modify its position then we should look at significant tariffs on exported GM vehicles from Mexico in order to get their attention,” he told a news conference. In their telephone discussion, however, the two leaders discussed the impact of the plant closings and what could be done to help the workers. Innovation Minister Navdeep Bains, who was in the Prime Minister’s meeting with Mr. Dias, said Ottawa is ready to look at options to save the Oshawa plant, including loans and subsidies. But he declined to endorse Mr. Dias’s call for Canada to slap punitive tariffs on imports of GM vehicles made in Mexico. Mr. Bains said the lesson of the planned GM plant closings in Canada and the United States is that tariffs don’t work, pointing to the U.S. tariffs on steel and aluminum. Getting Ottawa to impose tariffs on Mexican-made vehicles would be a long shot. Canada would have to prove that Mexico is providing unfair subsidies or selling vehicles below the cost of production in Canada. And given its condemnation of the United States’ use of national-security grounds to hit Canada with steel and aluminum tariffs, the government isn’t likely to go that route either. Federal cash helped other vehicle and parts makers to make more than $4-billion of investments in Canada since 2015, including significant expansions by Ford, Honda and Toyota, the minister said. “We want to see GM follow a similar path,” Mr. Bains said. Mr. Dias also said he will meet United Auto Workers president Gary Jones, who represents American auto workers, in Washington on Wednesday in a bid to begin mass walkouts at GM plants in the United States and Canada. GM on Monday announced it would cut six gas-powered car models as part of a plan to close factories and cut costs so it can spend more on electric- and autonomous-vehicle development. The reductions could amount to as much as 8 per cent of GM’s global work force of 180,000 employees. Mr. Dias said he told Mr. Trudeau he fears GM plans to disinvest totally from Canada within a matter of years, which would cripple Canada’s auto industry. GM has two other plants in St. Catharines and Ingersoll.